It should be said that we were not staying at "budget" hotels on this trip to Italy. 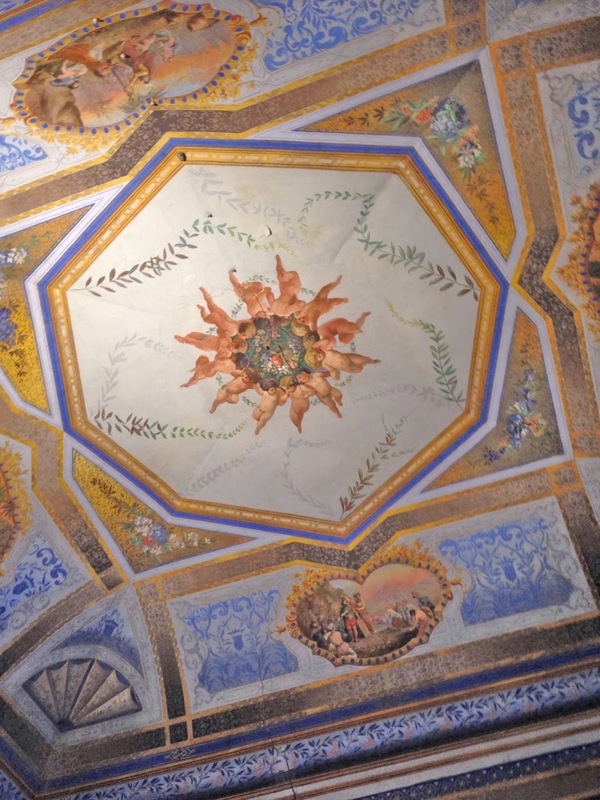 We chose the Villa Signorini Hotel in Ercolano because it was interesting and conveniently located to Herculaneum. The Signorini is a 18th century villa which has been converted to a hotel. While most of the rooms here are "ordinary" (and extremely affordable! ), there are a few (significantly more expensive) suites on the upper floor that are truly astounding. We occupied two suites (with 6 people). One had a large room with a queen and a sofa bed, and the other had two bedrooms, each with a queen sized bed. 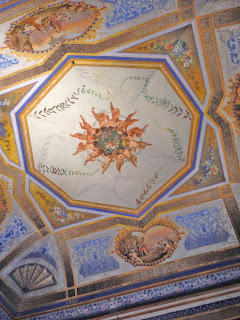 What made it so astounding was the frescos painted on the walls and ceilings. Just imagine -- when you wake, the first things your eyes see are this ceiling. The other reason we chose this hotel was that their restaurant is certified by the Italian Celiac Association!! The restaurant (Le Nuvole) is open to the public for lunch and dinner, and provides a breakfast buffet for hotel guests. We ate dinner in the restaurant the night we arrived. I had a pasta dish (substitute GF pasta) that was kind of like a lasagna without the layer-- the ricotta and tomato sauce were mixed together with the pasta. 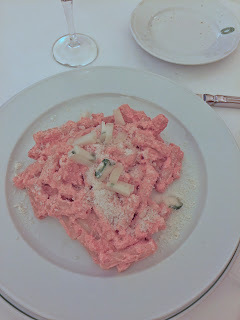 I cannot remember what they called the dish, but the menu said it was classic Roman cuisine. I enjoyed it, and it was the only pasta I was served in Rome that wasn't WAY too al dente for my tastes. (I don't want mushy pasta, but I don't want it to chip my tooth either!) We asked the server to recommend a wine, and his choice was excellent. There was also some gluten free bread. Breakfast at the hotel was a more casual affair. The buffet was very heavy on the sweets, including a GF chocolate torte, which was phenomenal. The other cakes and sweets on the buffet were glutinous, so they brought me a selection of pre-packaged GF snacks including cookies, rice cakes, and plum cakes. There was bacon and eggs available, as well as some deli meat and cheese. We were back again the next day for lunch and I had a delicious bean soup served with a gluten free roll (much better than the bread they served the night before). All in all, I felt the restaurant was above average and very convenient if you are staying at the hotel anyway. Other dining options in Ercolano are pretty limited. Sandy is the Accidental Housewife. Sandy has been gluten-free since 2004. She was self-diagnosed by following an elimination diet. Her mother, Cathy, is the Gluten Free Bama. She has been gluten free since 2008. Cathy was diagnosed as Celiac after an endoscopy with a biopsy. We both love food and travel!